Electronic music fans were treated with a Kraftwerk perform live with an astronaut on the International Space Station, at the Jazz Festival in Stuttgart, Germany on 20th July. 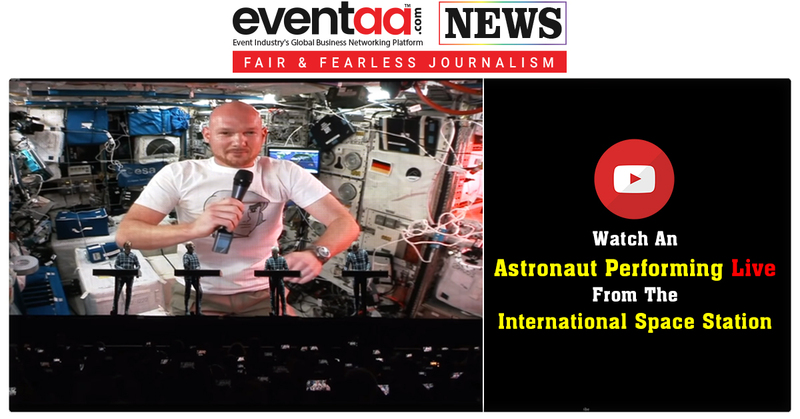 Teaming up with the German ESA astronaut Alexander Gerst - who is currently residing on the International Space Station (ISS) - the spaceman hopped on a video call with Kraftwerk and festival attendees to perform alongside the group. Astronaut performed in front of 7500 visitors from 400 kilometers (250 miles) above sea level and flying at a speed of 28,000 kilometers per hour over the Atlantic Ocean. During the call with space, Gerst played out the melody of the track 'Spacelab' from Kraftwerk's 1978 album 'The Man Machine' alongside Kraftwerk in real time with his tablet synth software. He was cheered by the audience as he started playing music from his tablet. He reminded the audience that the team aboard the ISS are currently researching things that will improve daily life on earth and are developing technologies that will help humans grow beyond our current horizons. He will live and work at ISS until mid-December 2018. He's not the first space musician. Canadian astronaut Chris Hadfield recorded a cover of David Bowie's "Space Oddity" and played a duet with the Bare Naked Ladies 400 kilometres above the earth in 2013. Watch a revised version of David Bowie's Space Oddity, recorded by Commander Chris Hadfield on board the International Space Station. Apart from them, American astronaut Ron McNair planned to play the saxophone from orbit with Jean Michel Jarre in 1986 but died in the Challenger tragedy.